By default, you’ll see three category tabs: Primary, Social, Promotions. If you’re receiving content you’ve opted in, those will go directly to Promotions category. This change can bring negative effect to brands and marketers. It’s like a barrier between companies and users. 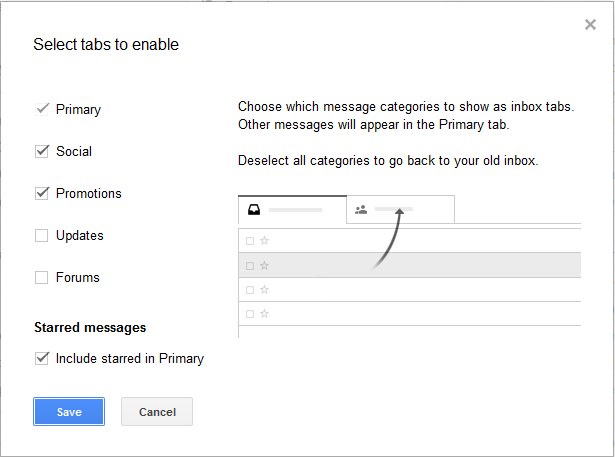 If you want to revert to the old Gmail inbox and remove those tabs, click the Promotions tab. Click the “+” next to the Promotions tab. See below screenshot. When the pop-up comes out, uncheck the Social and Promotions” box, and click save. Then you’re done. You now have your single inbox back. Step 2: I am an avid follower of “Marie Forleo” and I want to dive in to her videos once she sent it (every Tuesday). Find the email in your inbox. Voila, you are all set. Now, you can start filtering out the emails you want to receive in your Primary inbox or just simply remove those tabs.